We forgive kitchen clutter, and bedrooms are almost always going to have some clothes, books or debris on the floor, being the personal spaces they are. Most people aren't embarrassed about disorganized garages or basements in need of a little systematization, either. But if there's one room you always want clean and clear of clutter, it's the bathroom. 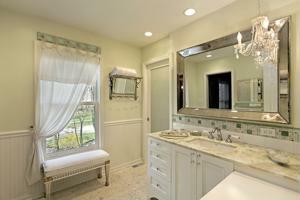 Other than your living room and foyer, the bathroom is the most visited spot in the home by guests. Furthermore, bathroom activities don't benefit from cramped space or having to watch where you put your feet. Rather than claustrophobia, give your guests the easy freedom they need and feel proud of your bathroom, all in one quick reorganizing makeover. Searching for awesome storage techniques? Look no further. These clever and stylish options will keep you, your guests and even your bathroom happy. 1. Ditch the vanity pedestal and get some cabinet space. While pedestals may seem like space-saving attributes in a small bathroom, the sacrifice is in the storage. Half the job of the vanity should be to conceal the things you can't hide in your medicine cabinet - toilet paper, band-aids, Q-tips, hair dryers and straighteners, lotion, hand towels and whatever else may be cluttering up your floor! 2. Set up a linen cabinet right outside the door. Here's a trick - keep some of your bathroom storage outside the bathroom. Not all supplies needs to be within reach at all times (though toilet paper does), so keep amenities like extra toothpaste or bath towels in a tall and attractive linen cabinet. It's easily accessible, helps reduce bathroom surplus and makes for excellent hallway décor. 3. Window shelving and corner nooks. Take these two oft-wasted locations and use them as prime open storage. Not only does shelving make your bathroom feel bigger, it's great to use for refreshing touches like flowers or scented candles. Give a corner a niche shelf or dress up your window ledge with seashells or a few themed ornaments. 4. Don't leave your reading material on the floor! It's pretty common to find a few complimentary magazines in your average home's bathroom, but it's gross to find them on the floor. If you want to leave your guests a book to skim or celebrity rag to flip through, keep it off the ground. Find more sanitary storage, like a rack or small bookshelf. To keep your bathroom storage interesting, look for unique containers to corral your items. You can then leave them on display or keep them inside cabinets. You can pick up inspired pieces when you see them at yard sales, on offer in home stores or at online auctions for example.